Los Angeles: Home of the Largest Landfill in the U.S.
Los Angeles is known around the world for glamour, glitz and charm. However, like their propensity to hide their cemeteries (people don’t die in L.A., they just go on forever vacations), they are also hiding another dirty little secret (literally). 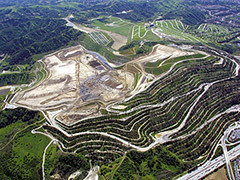 Los Angeles holds the record as being the home of the Puente Hills landfill, the largest landfill in the United States. The Los Angeles landfill consists of around 150 meters of garbage. Appearing as some kind of skyscraper, it has such renowned residents as cockroaches and rats. Years ago, the area was a dairy farm and over time it has become a geological trash heap, with each citizen contributing about seven pounds of trash per day. Besides being a visual monstrosity, the toxins that exist in the garbage of this Los Angeles landfill are contaminating soil and groundwater and are releasing tons of methane that is contributing to a massive greenhouse effect. In an attempt to attack this problem and turn trash into treasure (so to speak), the waste management department of Los Angeles has begun an intense recycling and re-managing process. They have established a network of pipes that collect the methane and use it to burn and change into electricity. This is currently equating to around 50 mw of power (enough to power around 70,000 homes). The recycling process may not be apparent when viewing this overpowering giant of the Los Angeles landfill, but it is slowly taking on a complete change through detailed separation of the various types of recyclable products. The layers of waste are also now being separated by a series of plastic membranes that have been designed to collect and contain the various noxious chemicals that might leak into the groundwater. Referred to as ‘leachates’, they are then filtered and cleaned, to make them safe. New study on smog, health and heart attacks – if you live in Los Angeles do not read this article. Posted on May 23rd under Global Ecology. A doosey of an idea. Who comes up with these things? I would love to do that to my own home, but the roof is slanted. Besides, I don’t have a very good green thumb, so I would need a lot of help and advice from people that do. Every metropolitan area in the world has problems with their trash and landfills were being created to try to help things biodegrade. The problem is, they put things in there that don’t break down. A number of years ago I heard about an area in Orange County that built an expensive community on a landfill. People started having problems when they went to have their swimming pools redone and tons of trash bubbled up from underground. Gives a whole new meaning to out of sight, out of mind. Heard about these kinds of things cropping up all over the place. A friend of mine who is a construction engineer always said that the rooftop is the most under used areas of any building complex. This concept should be a great one for every city. If each person in an apartment complex was required to sign a pledge to contribute to a roof garden, in exchange for food, it would help out the town, the people and bring about less pollution. It’s people like this that are going to change the world and I am so glad to be living in a time when this is happening. Doesn’t surprise me in the least. After all, LA is all about outward appearances and this article is definitely going to change some people’s minds about the LA area. People that live there constantly complain about East Coast people, but they are in denial about their own downfalls. The good thing is that they are trying to clean things up. Glad to hear that the town is trying to reverse all of the damage that they have been doing. Sadly, the word is out and I always wonder if the people that lived in the areas knew about it and tried to do anything to stop the constant dumping of trash. These people are marvelous at using the space to not only clean the atmosphere but grow food to feed their own population. I thought there was something like this going on in Chicago. They took some old buildings, refurbished them and changed the roof area into a food garden.